It became evident early Tuesday night at the Thomas & Mack Center that the question wasn’t if UNLV would defeat Northern Arizona but by how much. The Runnin’ Rebels (3-1) bolted to a 29-8 lead in the first nine minutes, held a commanding 53-25 edge at halftime and led by as many as 42 points en route to a 110-71 victory over the defensively-challenged Lumberjacks (1-5). It could have been a whole lot worse if UNLV coach Marvin Menzies didn’t clear his bench early and often. Sophomore guard Jalen Poyser led the Rebels, who shot 54.2 percent from the floor and connected on 11 of 29 3-pointers, with 17 points, six assists and two steals in just 24 minutes. Thirteen players saw action for UNLV with 10 playing 14 or more minutes. Six scored in double figures including seldom used 6-foot-10 freshman forward Djordj Sljivancanin who finished with 15 points, including a crowd-pleasing 3-of-3 from 3-point range. The bad news? Starting forward Christian Jones, the team’s second leading scorer (14.0) and top rebounder (7.0), didn’t suit up with what Menzies said was a foot injury that will need further evaluation. And freshman forward Cheickna Dembele, who just returned from a foot injury, played just five minutes after complaining of soreness in the same foot. HOW IT HAPPENED: Poyser and forward Uche Oforgbu each had six points and the Runnin’ Rebels had five steals during a 29-8 game-opening run, and the rout was on. WHO STOOD OUT: Who didn’t for UNLV? Ofoegbu finished with 10 points, eight assists and five rebounds and senior forward Tyrell Green had 15 points, nine rebounds and three steals, both in just 23 minutes of action. Senior forward Jordyn Martin, who prepped at Palo Verde High School, led Northern Arizona with a game-high 21 points on 8-of-10 shooting. QUOTE TO NOTE: “It was fun watching the whole team score. Basketball is supposed to be a fun game. When you see your other teammates having fun, we’re having fun. 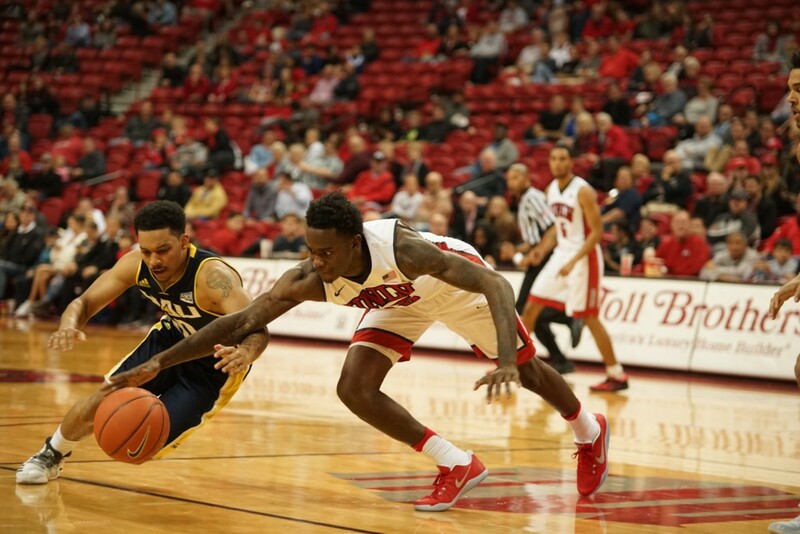 It’s just a beautiful thing to watch.” – UNLV guard Jalen Poyser. UP NEXT:The Rebels continue their season-opening six-game homestand on Friday night at 7:30 p.m. when it plays TCU in the third round of the Global Sports Classic at the Thomas & Mack Center. Washington and Western Kentucky play in the other third round matchup at 5 p.m. The championship game is Saturday at 7:30 with the two losing teams from Friday night playing at 5 p.m. NOTABLE: UNLV finished with just nine turnovers for the second straight game while forcing 16. … The Rebels had a season-high 26 assists on 45 field goals. … UNLV outrebounded the Lumberjacks, 50-34, and finished with big edges in fast break points (26-8), bench points (54-33), points off turnover (27-6) and points in the paint (60-32). Dwayne Morgan photo by Anthony Ervin Jr.